To purpose of the article is the use the RTMP Authentication Module in wowza Engine . This will enable us to intercept a connect request with username and password to be checked from any outside source like – database , password file , third party token provider , third party oauth etc. Once the password provided by user is verified with the authentic password form external sources the user is allowed to connect and publish. 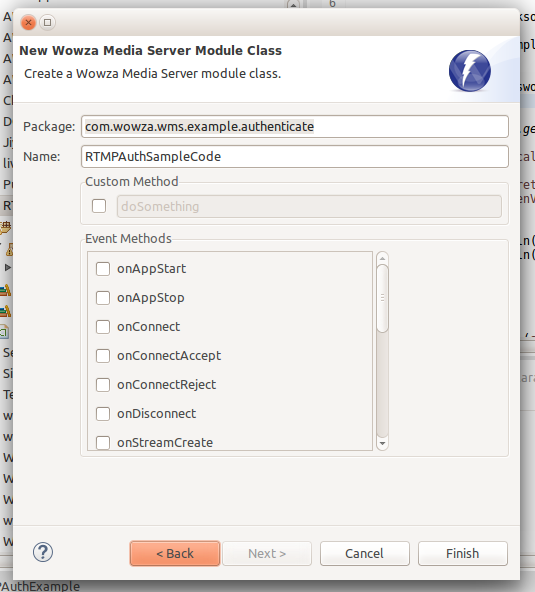 Step 1 : Create a new Wowza Media Server Project in Eclipse . 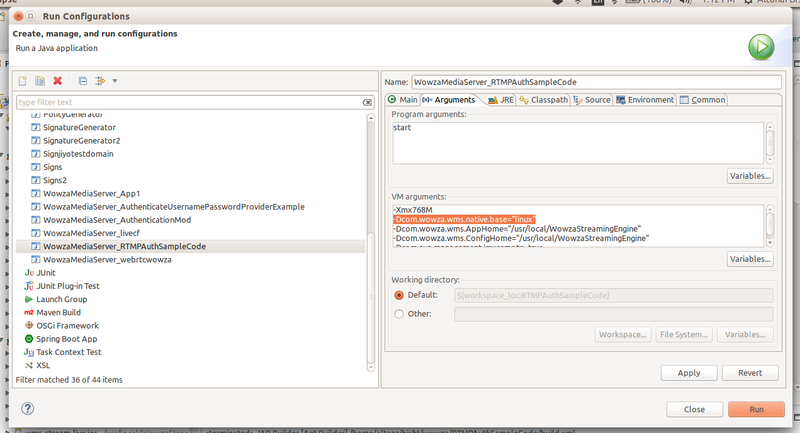 It is assumed that user has already integrated WowzaIDE into eclipse . Step 2: Give any project name . I named it as “RTMPAuthSampleCode”. 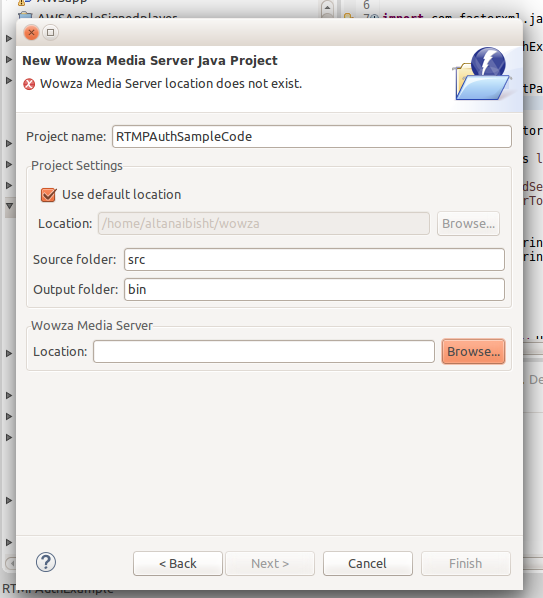 Step 3 : Point the location to existing Wowza Engine installed in local environment . Step 4 : Proceed with the creation , uncheck the event methods as we are not using them right now . Step 5: Put the code in class. The class RTMPAuthSampleCode extends AuthenticateUsernamePasswordProviderBase . Its mandatory to define getPassword(String username ) and userExists(String username). ModuleRTMPAuthenticate will invoke getPassword for connection request from users . We can add any source of obtaining password for a given username which will be matched to the password supplied by user . If it matches he will be granted access otherwise we can return null or error message . We may use various ways of obtaining user credentials like databse , password files , third part token provider etc . I will be discussing more ways to do RTMP authenticate esp using a third part token provider which using TEA.encrypt and shared secret in the next blog. Step 6: Build the project and Run. -Dcom.wowza.wms.native.base=”linux” inside of the VM Arguments . Its highlighted in figure below. 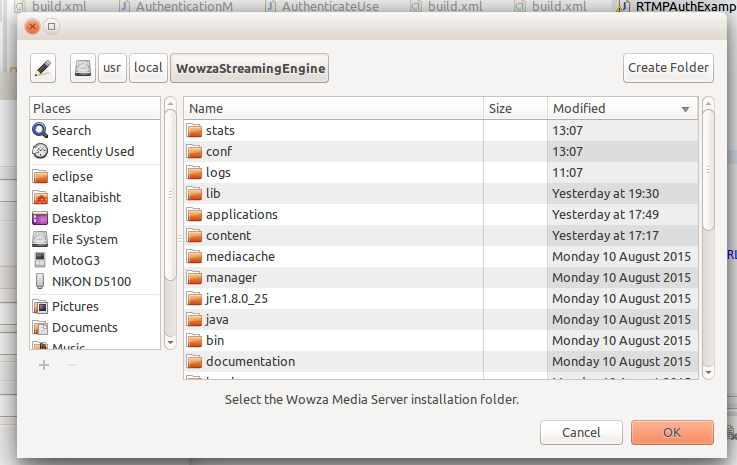 Step 8 : Open the Manager Console of Wowza. Also you can see that RTMPAuthSampleCode.jar would have been copied to /usr/local/WowzaStreamingEngine/lib folder. Add folder “RTMPAuthSampleCode” inside /usr/local/WowzaStreamingEngine/applications folder . Add folder “RTMPAuthSampleCode” inside /usr/local/WowzaStreamingEngine/conf folder . Copy paste Application.xml from conf folder inside RTMPAuthSampleCode folder and make the following changes . Step 11: Add property usernamePasswordProviderClass to Properties . 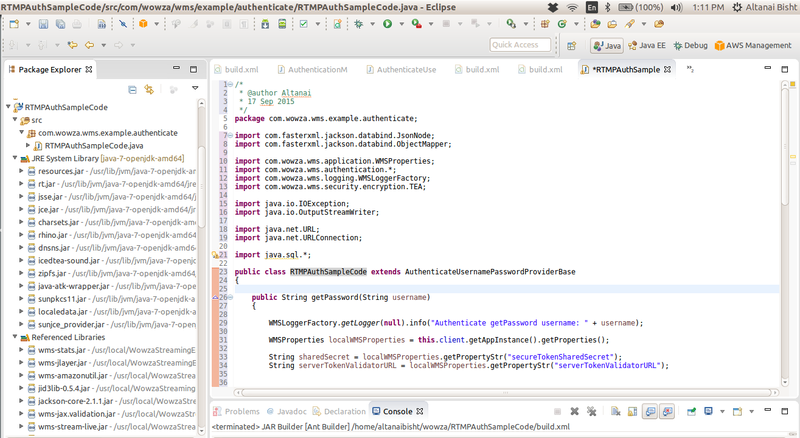 Step 12 : Make Authentication.xml file inside /usr/local/WowzaStreamingEngine/conf folder. Expand the archive and inside the extracted folder wms-server copy the file from location wms-server/com/wowza/wms/conf/Authentication.xml to /usr/local/WowzaStreamingEngine/conf. 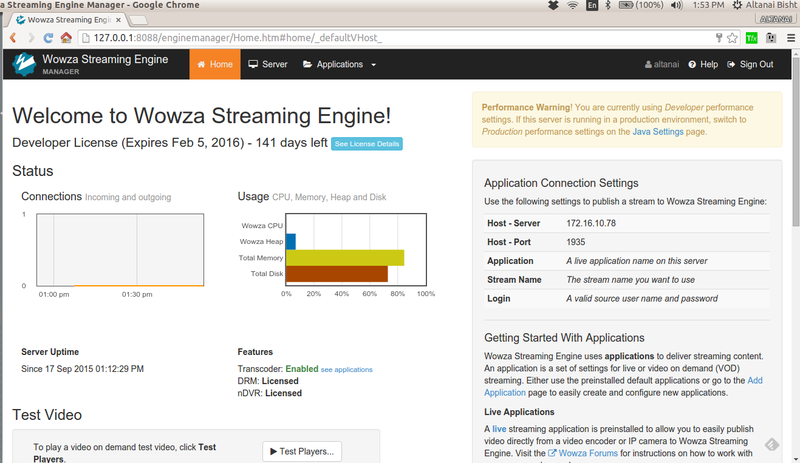 Step 13 : Restart Wowza Media Engine . Step 14 : Use any RTMP encoder as Adobe Live Media Encoder or Gocoder or your own app ( could not use this with ffmpeg ) and try to connect to application RTMPAuthSampleCode with username test and password 1234. Step 15 : Observer the logs for incoming streams and traces from getpassword . If you want the user test to have permission to publish stream to this application then return 1234 from getPassword else return null .